After listening so many records by Pat Metheny, we realize this is the album that delivers the best of him and his close collaborators. It took us long to figure this out since we were looking for his virtuoso chops and determine which of his solos was the best in each album. Wrong move for a thrill-seeking listener: Pat's subject is melody, and Still Life is here to prove it. 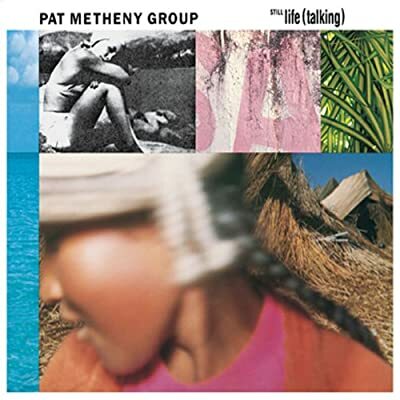 We already know how good and fantastic the Pat Metheny Group can sound live and how amazingly the engineers can transfer that concert energy into records (Travels, The Road To You, Trio Live.) But have we heard a very detailed, maybe over-produced, Pat Metheny creation in a recording studio? Do we know how perfect an album can be and become, through the years, into a beloved companion of everyday life? Guitar master Metheny and his co-leader, keyboard virtuoso Lyle Mays, create a perfect crossover jazz record out of a rock and roll recording studio and label: Geffen. After signing the contract, they got more studio time to work on certain details they didn't work on their previous records with ECM, their former record label. First of all, Still life is ethereal and its music fragile and sensitive. It is an instrumental album full of references to emotions, more than objects or specific situations. The beginning of the record is inviting, and for someone who has never heard Pat Metheny's musical structures, this can be a revelation. "Minuano" introduces the listener to World Music on a crash course. Lyle Mays' synths carpet the way for David Blamires and Mark Ledford's haunting vocals, calling for a service in which the listener wildefinitelyly know what abstract means without feeling uncomfortable. The main melody of the tune is extremely whistle-friendly and will live in your head like a happy songbird for at least one month, just to be replaced by "So May It Secretly Begins." Like somebody whispering a secret to your ear, the song just amazes you little by little. If you listen carefully, Steve Rodby on Bass and Paul Wertico on drums will create little counterpoints with their instruments, while Lyle overflows the spectrum with his traditional synth playing. The only "material" element we find is the subject of the third song, "Last Train Home,"A ballad with a locomotive-like percussion work that makes you want to just travel and feel you're leaving your own space. After setting this song as the solid center of the album, we can go back and forth into the magic of an album that can get the shapes we want, realizing that life is a journey indeed. This triumph of the band is the best song about train travel and departing ever written and performed. If you had listened to the LP, "Train" is the last song of side one and to wake up from that dream, get up and flip the record will be hard to do; But it will get a reward with "(It's Just) Talk," another funky Metheny tune dressed with Brazilian percussion work from Armando Marcal. "Third Wind" pushes the band to their limits, playing very fast and enjoying it. It becomes the climax of side two and lets two final ballads,"Distance" and "In Her Family," end the record so quietly we won't even notice their existance. That ethereal. Still Life, for the average listener, will be at the beginning just another PMG product; but the melodies and the quality of the playing make the listening experience just something else. This record will grow up on you and you'll be happy about it. Pat Metheny talks about the making of this piece of art on this podcast. Letter From Home (Geffen, 1989): Pedro Aznar replaces Blamires and Ledford on vocals in this beautiful sequel to Life. "Better Days Ahead" is the best tune of the disc and that sets the band straight for the World Tour. Zero Tolerance For Silence (Geffen, 1994): Not the Pat present in Still Life. Here's Pat playing a distorted and over-amplified guitar, for almost 40 minutes.